The original Mighty Morphin' Power Rangers TV series was one of my first introductions to the idea of leitmotifs. I remember being aware that the heroes had a specific theme, the main villains each had their own themes, and even the bullies, Bulk and Skull, had their own specific musical identity. I was keenly aware of these melodies, and used them whenever I would play with my Power Rangers action figures, providing my own soundtrack to whatever story I came up with. While the music from the original series wasn't anyone's idea of a great score, it made quite an impression on my young mind. 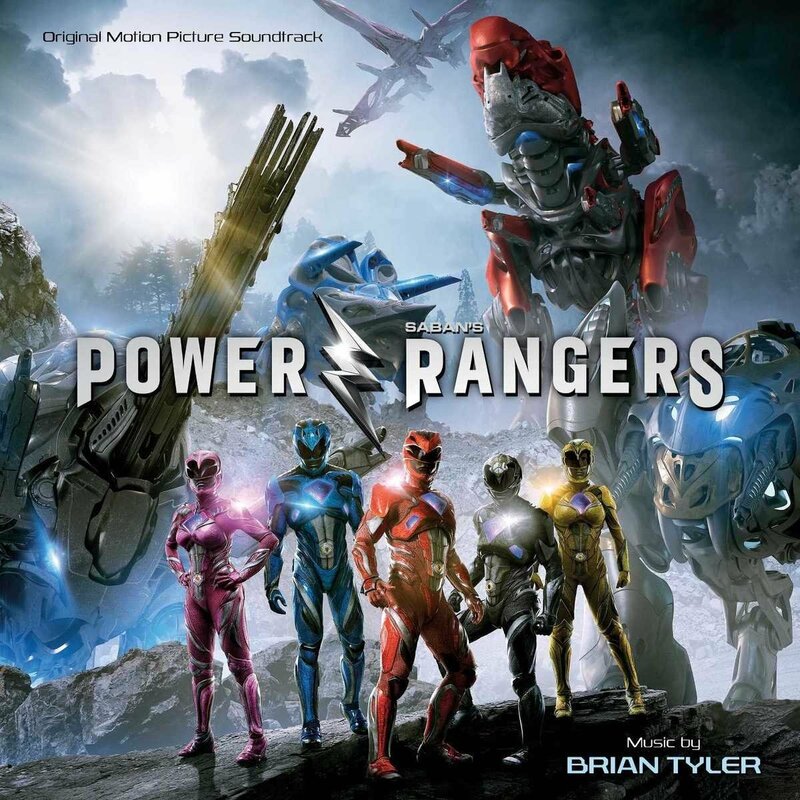 Brian Tyler's score for Lionsgate's new reboot is only based around a single new theme for the Rangers, the rousing anthem made me feel like a kid again. That old magic was back. Tyler's score doesn't have quite the same diversity of motifs as the original series did, but he makes up for it by crafting one humdinger of a main theme, first introduced in the aptly titled "Power Rangers Theme" and revisited frequently throughout the score. The rising chord progressions are a familiar structure for film score fans, but just try not to feel the hair on your arms stand up when Tyler really kicks the theme into high gear in tracks like "Megazord" and "It's Morphing Time!," which also throws in some 80's-style synths reminiscent of Giorgio Morodor, or more recently, Daft Punk's Tron: Legacy. On the whole, the score has a darker tone than the almost sprightly themes of the original series, reflecting the teen angst that permeates the film. Tracks like "Birth of a Legend," "Metamorphosis,"and "The Morphing Grid feature an almost melancholy acoustic sound, but one that never strays to far from optimistic. Power Rangers is certainly more serious than the TV show, but it thankfully never takes itself too seriously. SABAN'S POWER RANGERS. Image courtesy of Lionsgate. As a result, Tyler plays it mostly straight in the score, even as the film sometimes plants its tongue firmly in its cheek. Tyler helps balance the moments of levity by never allowing them to fall into parody, imbuing the film with a sense of gravity. "Confessions" offers a contemplative version of the main theme, as the five teens finally start to open up to each other about their own painful pasts. The Morodor-style synths return in "Goldar," which is also one of the score's most heart-pumping action tracks, and "The Zords," providing a pulsing bass line rather than taking focus. The villain, Rita Repulsa, also gets her own slithery identity in "Rita," comprised mainly of pulsating strings, before building to a thunderous crescendo. But the moment everyone is waiting for, of course, is the integration of the original series' catchy theme song, "Go Go Power Rangers," which finally bursts forth triumphantly in "Let's Ride," a moment that was ultimately replaced by the actual vocal version of the song in the film. Tyler uses the theme sparingly, not unlike Ludwig Goransson's score for Creed, holding back the classic theme until just the perfect moment - in this case the emergence of the Zords as the rangers head off to fight the monstrous Goldar. Tyler reprises the original theme in a more complete version in "Go Go Power Rangers - End Credits," but the score's real emotional climax comes in "Hold the Line," which accompanies the moment when the Rangers truly begin to work together as a team, just before uniting to form the Megazord. The album itself isn't in chronological order, but the arrangement is nevertheless a fully realized and satisfying experience, providing grand scale heroic anthems as well as a nostalgic sense of childhood wonder. It may not break any new ground, musically speaking, but it's a hell of a lot of fun. I loved every minute of it. Now available on digital platforms from Varese Sarabande, and available on CD April 21st. Blu-Ray Review | "The Umbrellas of Cherbourg"